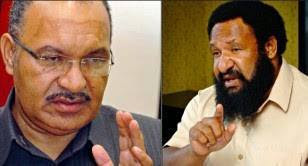 PORT MORESBY: Opposition Leader Don Polye today (Tuesday) warned Prime Minister Peter O’Neill not to cover up his government’s negligence over the landslip at Guo village in Chimbu. Mr Polye said he should have admitted that due to the country’s cash flow crisis, the government did not intervene swiftly to remove debris blocking the road. Polye has called on the Prime Minister to respect much-needed contributions and efforts by the business sector to help open the highway for the public, something which his government gave blind eye to. “Him talking down their contribution adds more stress to what he has already inflicted on them-depletion of foreign reserve due to his government’s economic mismanagement,” he said. “This is the truth. Where was the Prime Minister when similar instances of massive landslide occurred along the Highlands highway in the recent past? He was commenting on O’Neill’s announcement for a tougher law on people blocking highways. “If he is really serious about passing a tougher law to penalise our people blocking highways, he must first pass bills like the Independent Commission Against Corruption (ICAC) and Whistleblowers Act,” an irate Polye said. He said these important legislations were collecting dusts for more than two years yet the Prime Minister thinks fit to pass this law which will impose tougher penalties on highway blockers. “The Prime Minister knows it very well that these laws will bite back his fingers. Instead, he is now desperate on laws to penalise our people,” he said. The Opposition Leader blasted O’Neill for bring such a law at the last minute, given that the General Election is looming. Polye queried where his priority was all these time. He said last Friday he visited the landslide site at Guo village whilst travelling to Kundiawa from Hagen to attend an official program. He, a civil engineer, added he learnt that the landslip was a result of the government’s failure to maintain the highway like many others nationwide. “When we are in government, I will budget K3 billion for the maintenance of the major highways in the country.